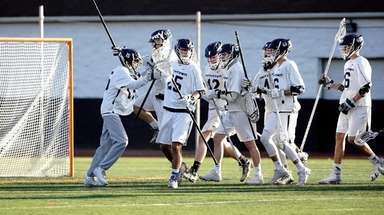 Tristan Capes-Davis scored three goals including the winner unassisted with 2:42 left in overtime Wednesday to lift host Harborfields over Sayville, 9-8, in a Suffolk League III boys lacrosse game. Kyle Lumpe made 14 saves, including a point-blank stop with 3:19 remaining in overtime. Sayville's Jack Coan tied it at 8 with 59 seconds left in regulation. Terrence Haggerty had three goals and one assist and Connor Bennardo added one goal and two assists for the Tornadoes (2-1). Commack 13, Lindenhurst 12: Kevin Snyder's fourth goal of the game gave the Cougars a 13-11 lead with 3:44 left in the fourth quarter of its League I win. Mike Paccione and Mike Ambrosino each had two goals and one assist for Commack (1-2). Brian Steiger had four goals and three assists for Lindenhurst. 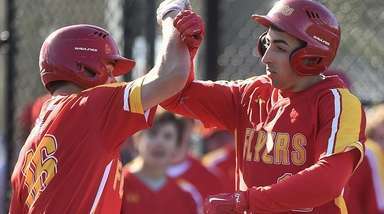 Chaminade 8, Iona Prep 1: John Montalbano and Will Renz each had two goals to lead Chaminade (2-1) in non-league. Half Hollow Hills West 10, Riverhead 5: Ryan Ozsvath had four goals and one assist, and Cam Mule added one goal and four assists to lead the Colts (1-2) in League II. New Hyde Park 8, Elmont 3: James Brook scored four of his five goals in the third quarter to lead New Hyde Park (1-0) in Conference B-I. The Gladiators trailed 2-1 at halftime before scoring five straight goals in the third. Calhoun 12, Wantagh 10: Kevin Dolan scored four goals, and Spencer Kaufman added one goal and four assists for Calhoun (1-0) in Conference B-I. Senior Griffin Miller had a career-high 22 saves in the win. Wantagh's Dylan Beckwith scored four goals and two assists. Jericho 9, Bellmore JFK 8: Zac Montanez had three goals and three assists, and Noah DeMatteo added three goals to lead Jericho in its Conference B-II opener. Montanez scored with 41 seconds left in the third quarter to give Jericho a 9-6 lead. Mike Calisto had two goals and three assists for Jericho. Smithtown West 8, Penfield 0: Danny Varello won all 11 faceoffs and had 11 ground balls to lead Smithtown West (4-0) in non-league. It was the Bulls' first shutout since 2005, according to coach Bobby Moltisanti Jr. Kyle Zawadzki had two goals, and Zach Lamberti had six saves. 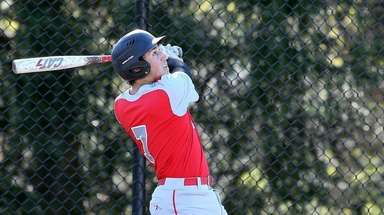 Sewanhaka 11, Great Neck North 7: Peter Militano had four goals and two assists for Sewanhaka (1-0) in Conference B-I. Trevor Regnier added two goals and six assists. 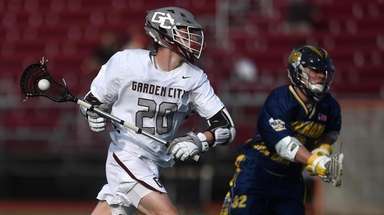 Dylan Campbell led GNN with four goals. GIRLSBabylon 10, Comsewogue 6: Shannon Hartigan had four goals, one assist and three draw controls for Babylon (2-1) in Division II. Shayne Antolini added two goals and three assists. Rocky Point 18, Bellport 13: Madison Sanchez had four goals and three assists, and Adrianna Greco added four goals and one assist to lead Rocky Point (1-2) in Division II. Sayville 9, West Babylon 6: Lauren McNeil had three goals, Kelly Marra had two goals and one assist, and Erin Koehler grabbed six ground balls to lead Sayville (2-0) in Division II. Hauppauge 9, Shoreham-Wading River 7: Sydney Nino scored four goals for Hauppauge (3-1) in Division II. Casey Cummo had two goals, and Katie Murphy added one goal and two assists. 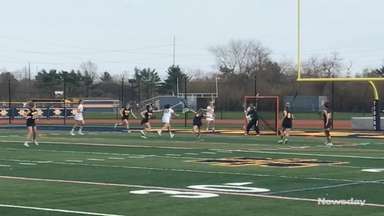 Commack 14, Riverhead 9: Amy Hauser had four goals and five assists, and Diana Johnston added four goals and one assist to lead Commack (2-0) in Division I. Great Neck South 11, Elmont 9: Allie Mirsky had three goals and one assist, and Mia Oginski had two goals and one assist to lead Great Neck South (2-2) in Conference V.
Division 10, Roslyn 5: Alex Sparrow's seven goals and one assist led Division (6-0) in non-league.Friends Academy 16, Glen Cove 11: Madison Reilly had six goals and two assists to lead Friends Academy (1-2) in non-league. Julia Ciardullo and Caroline Sgaglione each added a hat trick.